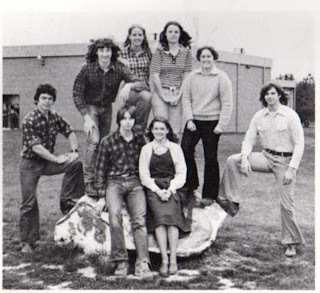 Like many schools, Revere High has a school rock. This boulder was unearthed when they first built the school in the 1950s and plopped in front of the main entrance as a feeble stab at landscaping. 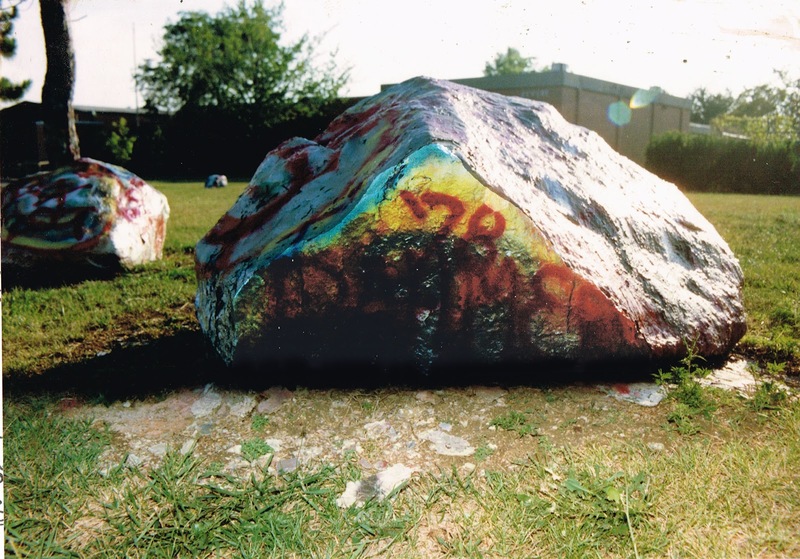 Almost immediately, students started applying paint to the rock, using it as a People's Billboard to announce everything from which class ruled above all others, to which rival football team was facing an impending humiliating doom to the occasional (and quickly removed) insult directed at the officious asst. principal. 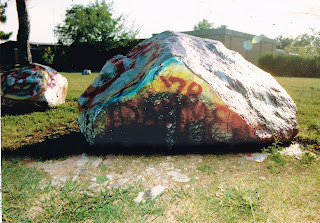 By the time I reached high school, the rock had an outer coating of two inches of paint from 1,000 previous whitewashes. The rock was a gathering point for members of the Dahmer Fan Club. The band practice field was just across the street and, weighed down by a heavy brass sousaphone, I used the rock as a convenient resting place (if the paint was dry, that is) to take a break and shoot the crap with friends. On warmer days, the front lawn was filled with kids, especially members of the massive marching band. Dahmer was usually lurking about, too. He liked to hang out outside the band room. It was a large, windowless wing of the school building, which shielded him from observation from other parts of the building. Unless a teacher made a point of walking around the perimeter, and none really did, he could spend entire periods here in a drunken stupor. And it also afforded him the opportunity to be near us, even though he had dropped out of the band after junior high. The big double doors of the band room, below, were usually open, except during the coldest months, to offer meager ventilation to the 200-some, sweaty bandies who were crammed elbow-to-elbow on the risers inside, blasting out tunes in teeth-rattling volume. Most of the fan club were band nerds, so Dahmer was naturally drawn to these doors, since he flitted about our periphery, desperately latching onto what little social contact he could. He'd often leer at us during rehearsal through the opening, cracking us up and then magically disappearing if the straight-arrow band director caught a glimpse of him out of the corner of his eye. He was never caught once. As always in this tale, there was a darker flip side to our goofball antics. 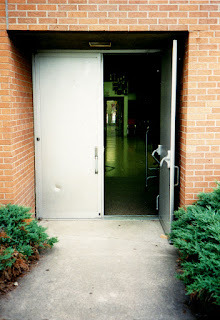 In the mornings, before the first bell, Dahmer would stumble through these doors into the band room, which also served as our home room, reeking of booze. The band room was essentially unmonitored by a teacher, since the director was usually squirreled in his office. School officials were watching the parking lot for trouble from the school stoners, not monitoring the band room full of compliant nerds. Dahmer always skillfully managed to find the flaws in school security. The school rock also served as a convenient photo setting for various yearbook pictures. Below is one such club. Friend Neal is taking the picture, In the background to the left, are those band room doors. The figures in the doorway are Dahmer, myself and friend Mike. Mike and I are trying to convince Dahmer to sneak up behind the group and position himself in the photo. It was our running gag to slip him into as many yearbook group photos as we could. We obviously didn't pull this one off. When the news of Dahmer's crimes first exploded in July 1991, I drove down to my folks' house to rifle through the boxes of high school material stored in the basement, as art for stories in the Akron Beacon Journal, where both my wife and I worked at the time. My parents live very close to the high school and I passed it on the way. 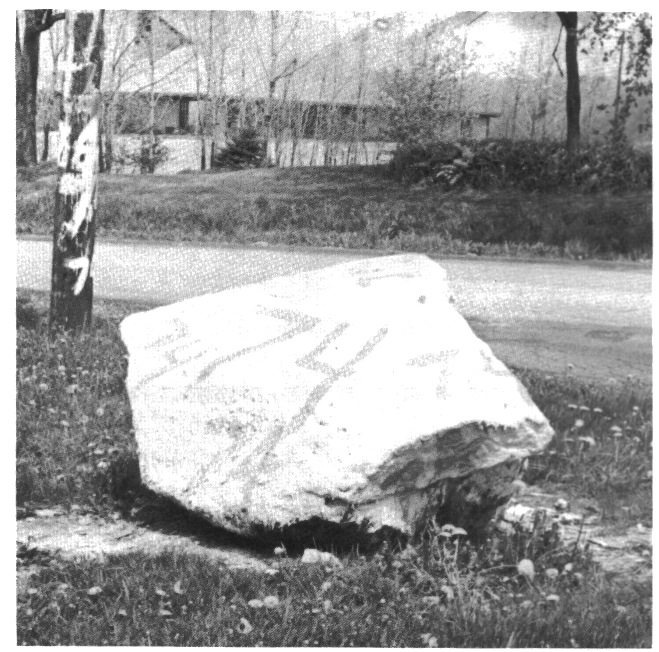 As I did, I observed that some smartass had already painted "Class of '78- Dahmer" on rock, mere hours after Dahmer had been arrested! The first of many surreal moments. I stopped and snapped the photo below.